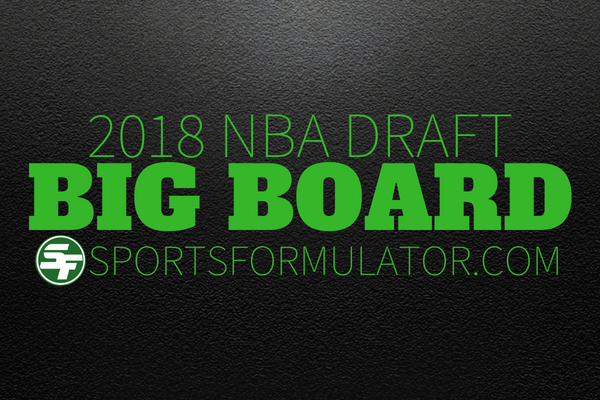 The 2018 NBA Draft is tonight so it’s time to unveil my 2018 NBA Draft Big Board! That means it’s time to give NBA GM’s a heads up on who’s the best player available at their draft position. This is who I think are the best prospects in 2018, not where I expect them to be drafted. For that, check out my 2018 NBA Mock Draft. Here’s the SportsFormulator 2018 NBA Draft Big Board ranking the 30 best prospects. Send me SportsFormulator's NBA predictions. Luka Doncic (G – Real Madrid) – He’s been playing as a pro already and is just 18. He’s NBA ready. He’s got multiple NBA All-Star appearances in his future. Marvin Bagley III (PF – Duke) – Bagley can score from all over. He needs to improve his D some but he will score and rebound as a rookie. Collin Sexton (PG – Alabama) – He can get to the basket and finish. He was the go-to player as a freshman at Alabama and carried his team to the NCAA Tournament. Wendell Carter Jr. (PF – Duke) – He will be a steady starter in the NBA for the next decade. I think he averages a double double for his career. Trae Young (PG – Oklahoma) – Simply put, he’s a playmaker. Young had one of the best freshman seasons in NCAA history. Can he handle the NBA? Teams are going to beat him up nightly on the defensive end to see if he’s still standing late in the fourth quarter. Jaren Jackson (C – Michigan State) – Great athleticism. Such a versatile player. He’ll be a tremendous asset to a team needing defense and rebounding. DeAndre Ayton (C – Arizona) – Ayton has offensive skills. My biggest question, will he help a team win? I think he’s a guy who’s going to put up numbers on bad teams. Lonnie Walker (SG – Miami) – Walker is a scorer. He has real potential to become an All-Star in the NBA if he can become more consistent. Michael Porter Jr. (SF – Missouri) – MPJ was the best player in the country his senior year. His freshman season at Mizzou didn’t go well. Injured for nearly all of it and was erratic the few games he played. Can he handle an 82 game season? Kevin Knox (SF – Kentucky) – Outstanding athlete. He’ll contribute from day 1 as he can score from the wing and play defense. Shai Gilgeous-Alexander (PG – Kentucky) – He’s a leader. Plays with confidence and has a lot of potential. I don’t know if he’ll ever make an All-Star game but 10 years from now he’ll still be running a team in the NBA. Mo Bamba (C – Texas) – I’d say he’s the draft’s most intriguing prospect due to his size and wingspan. If he can learn to score consistently and continue to be a defensive menace, he could become a great player. A lot of work to do though. Mikal Bridges (SF – Villanova) – He’s a good defender and can hit the outside shot. Zhaire Smith (SG – Texas Tech) – Intriguing prospect. Was unheralded at Texas Tech but ended up leading them to the Elite 8 as a freshman last season. He’s got serious potential in the NBA. Robert Williams III (C – Texas A&M) – He’s a physical player who can hold his own in the paint. He’s a double double guy. Miles Bridges (SF – Michigan State) – I think he’ll be a great role player with his ability to defend the wing but can he create his own shot or be a good enough shooter to just spot up? Troy Brown (SG – Oregon) – Great perimeter defender who can create shots. Keita Bates-Diop (SF – Ohio State) – Versatile player who will be a steal for a playoff team in the middle of this draft. Kyri Thomas (SG – Creighton) – Outstanding defender. Needs to work on his ball skills to become a consistent scoring threat in the NBA. Donte DiVencenzo (SG – Villanova) – Broke out at the Final Four at Nova. He’s going to be a solid contributor to a team. The big question, can he become a star or will he just be a role player? Chandler Hutchinson (SF – Boise State) – He’s a guy used to carrying his team. I think he contributes off the bench with solid minutes right away for a playoff team. Bruce Brown (SG – Miami) – Can defend right away but has to improve his scoring ability to become a starter in the NBA. Kevin Huerter (SG – Maryland) – Tremendous shooter. If he finds his range in the NBA could become a big time threat from deep. Elie Okobo (PG – France) – He’s a scorer. I think becomes a guy who can contribute off the bench and be a playmaker for the second unit. Justin Jackson (SF – Maryland) – He’s got potential to become a starter. He plays hard and can defend multiple positions. Jacob Evans (SF – Cincinnati) – Can shoot and defend on the perimeter so he’ll get playing time in today’s NBA. Dzanan Musa (SF – Bosnia) – Needs to become more disciplined but shows flashes of being a reliable scorer. He’s got experience but will need a coach who can mold him into a quality NBA starter. De’Anthony Melton (SG – USC) – Fantastic defensive player. He’s a guy who you can assign to defend a great scorer on the other end but don’t expect a lot of scoring. Josh Okogie (SG – Georgia Tech) – He’s a versatile player who’s going to be an energy player off the bench. Grayson Allen (SG – Duke) – Allen can shoot but can he become next JJ Reddick? Access more NBA predictions, picks and winning info from SportsFormulator.